WHERE THE WILD THINGS ARE: A Childs Great Escape into the Wild! Re-created from the 1963 story, written and illustrated by Maurice Sendak, “Where The Wild Things Are” opens today. With this film, director, Spike Jonze stated, he set out to NOT “make a children’s movie….but to make a movie about childhood”. 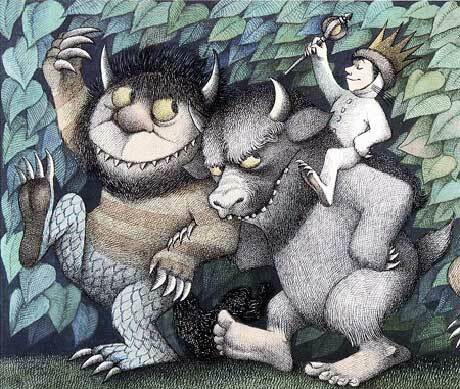 A classic childrens book written and illustrated by Maurice Sendak, “Where The Wild Things Are” is where a child’s fantasy world teaches him the strengths within himself as he combats the difficulties of becoming a young man and discovers humanistic qualities in these wild creatures that are similar to his own families when he runs away to them. This movie is visually stunning. Much of the dark cinematography is true to the pages in the book. A film that took twelve years in the making by producers Tom Hanks, Maurice Sendak, and Gary Goetzman met their director in Spike Jonze, former video director, and director of feature films, “Being John Malkovich, and “Adaptation”. Jonze accomplished staging the film in a way that makes it feel real, not like a dream or fantasy. With this film, Jonze stated, he set out to NOT “make a children’s movie….but to make a movie about childhood”. Young actor, Max Records, who plays Max is very impressive and believable. His emotions are real, and is able to achieve bringing audiences into his world without question. I detect a very successful future leading man in the years to come. The character, Max, is going through that awkward phase that all kids go through. He is experiencing an overwhelming feeling of loneliness, and being misunderstood. He’s got an over-strained single mother, and a teenage sister. All of this leads up to an ultimate escape to where the wild things are. Max is crowned king of the 'Wild Things. Seen here with Carol. After Max’s arrival to the island (an Australian location was used) where the 9-foot hairy creatures, “wild things” reside, he is immediately threatened with their desire to eat him. In order to fend them off, he creates stories of being a king with worldly adventures as well as holding super powers. The leader of the group, Carol (voiced by James Gandolfini) is convinced and says “I have a good feeling about him”. Soon, the two create a close bond. Cast of other starring voice actors are: Lauren Ambrose (KW), Chris Cooper (Douglas), Catherine O’Hara (Judith), Forest Whitaker (Ira), and Paul Dano (Alexander). The creatures in ‘Wild Things are well represented by two sets of actors. One each for their voices, and one each for their Australian suit-wearing actor counterparts. Director, Spike Jonze had the stars of the film, act out the whole movie over two weeks on a sound stage. The voices and footage is what the Australian puppeteers went off of to achieve the physical theatrics on location combined with CG facial features done in post production is what audience see in the film. 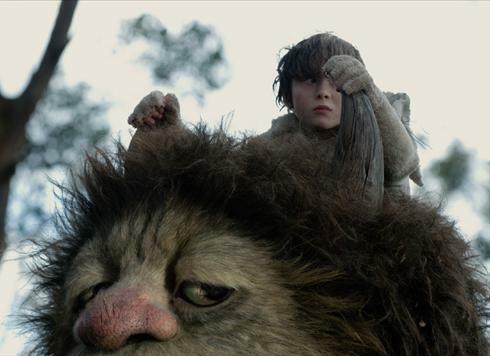 The secluded island of “Where The Wild Things Are” consists of emotionally and governmental instability amongst the creatures. Highs of rocks and trees, and lows of the smooth sand dunes and beach. Being in control of the them and their land is a child’s fantasy where all child-like things happen including, dirt clod fights, bashing-in branch structures, and a lot of rough housing in general. As emotions and actions heighten, Max has a revelation of his own about himself and his family. His changed perspective forces him to realize that he didn’t have it so bad at home, and that no where is perfect…even in a fantasy world you create.